Tom’s Voluminous Variety of VWs! Like nearly everybody else in America, I did not go see Herbie: Badly Animated Fully Loaded. 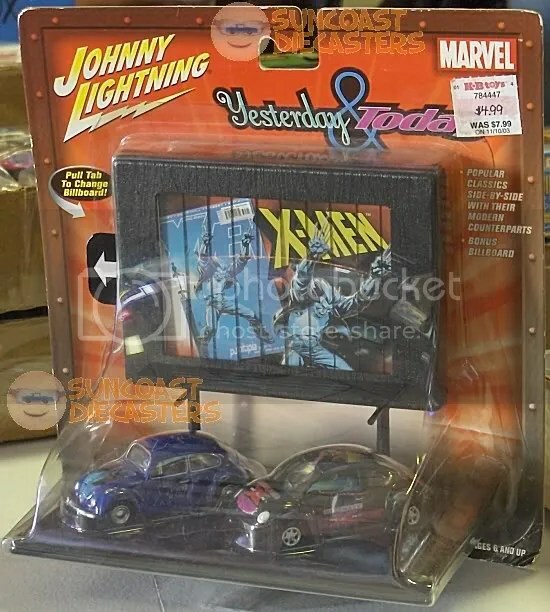 So, I have no idea if this vehicle was even in the movie. But, ’tis a nice large-scale replica, and if it putts around under battery power, so much the better. Tom was having difficulty deciding which of two sets to buy. I kept goading him on to get this one, with its sweet Karmann Ghia. Wouldn’t ya know, he ended up getting both. 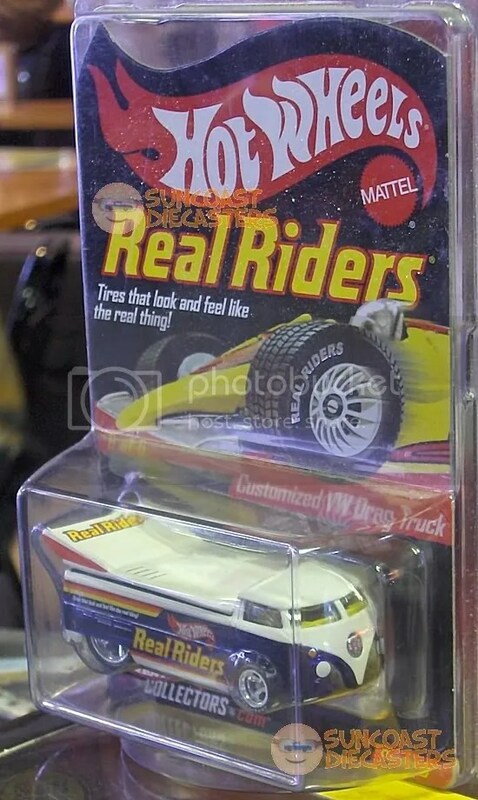 Now this is thoughtful: the modern classic Volkswagen drag truck backed by the retro classic Real Riders imagery. 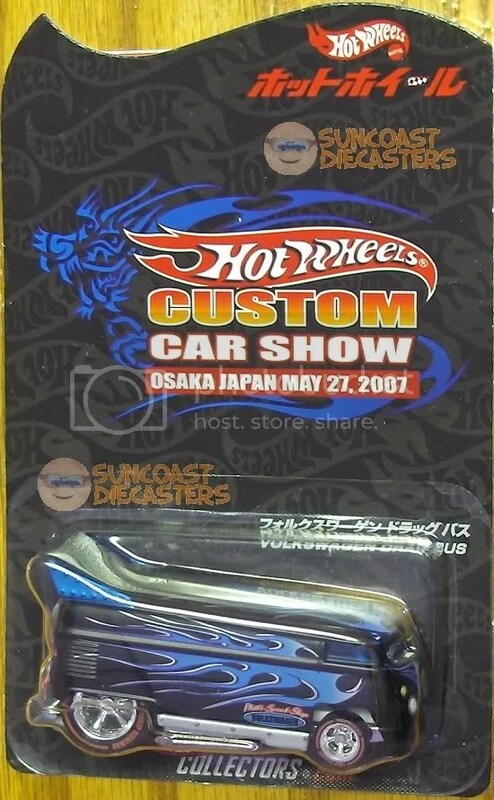 Model looks incredibly good, all done up in Real Riders livery like that. 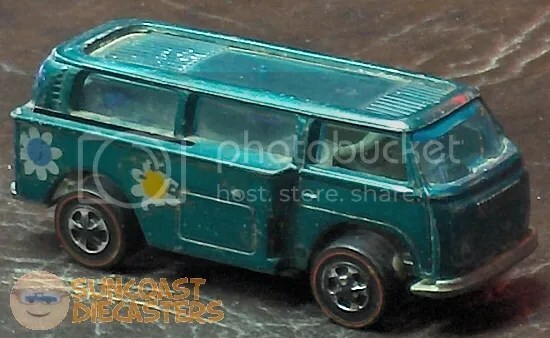 Yes, it’s true: Tom bought this set just for the T2 and the Bug. But, that “Action Radar” TV van looks pretty sweet. 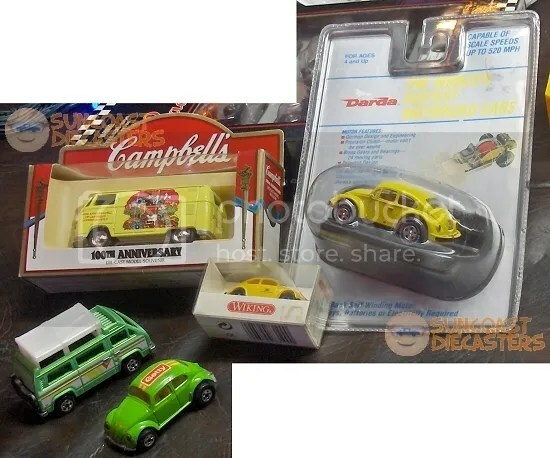 Tom scores much happy two times with Honorable VW Drag Bus: once with fine customized vehicle, twice with rare Osaka Toy Show packaging! Hi-YAAAA!!! 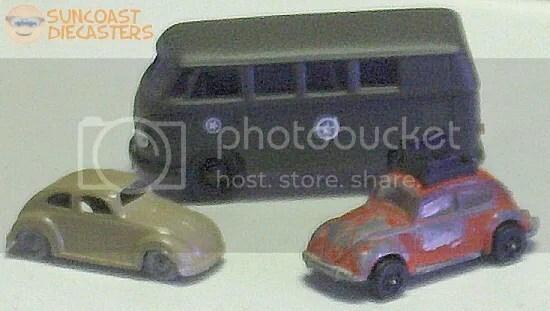 This is a sweet, sweet find: Schuo Piccolo series classic VW Bug. Well, I guess it wasn’t “classic” back then, it was “original”. 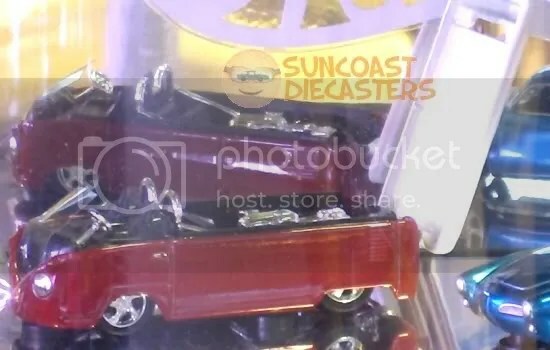 You may notice that the “windows” are painted on; that’s because the body is a solid cast of metal. And I mean solid – this tiny tub has some serious heft for its small size. And how small is its small size? 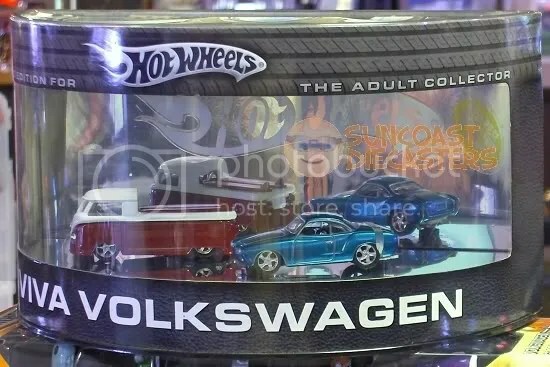 Well, here it is next to Hot Wheels’ 1:87-scale VW, which seems a pretty fair match. Which, again, makes the hefty mass of the Schuco just that much more impressive. 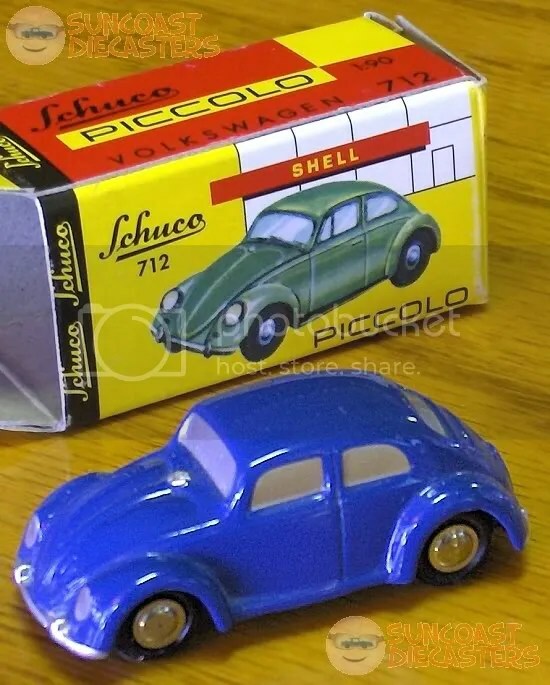 Yeah, the HW VW has better detailing … but I’d prefer to have the Schuco. 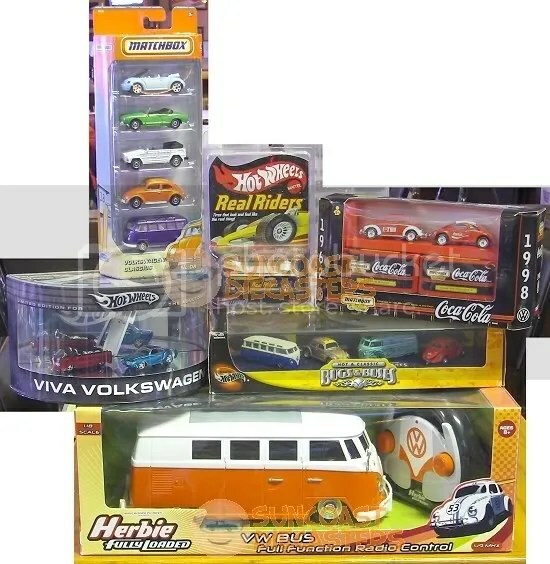 Tom gathered several nice holiday goodies during our December ’12 meeting, providing himself with a Very Volksy Christmas. 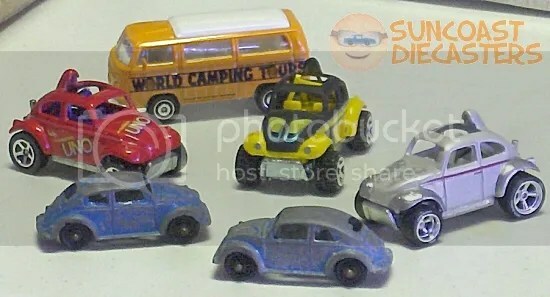 Starting at bottom left, we see: the Getty premium VW Beetle; Sunagon (The Hot Ones re-issue); Campbell Soup 100th Anniversary; a Wiking 1:87 Beetle; and a Darda motorized Beetle. Yes, Darda. Those of you who remember the mid-70s may fondly recall the intoxicatingly fast speeds promised by the Darda Buggy. 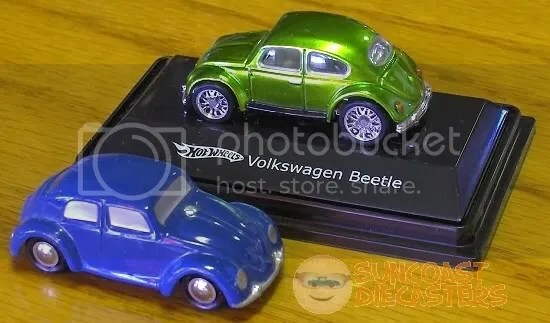 Tom added both versions of the Kar Keepers edition of the Baja Bug to his collection at our February meeting. Tom goes all buggy at our April ’13 meeting, as he bugs out and buys a bunch of bugs, because it was bugging him that these bugs weren’t snug as a bug in a rug in his personal bug collection.